Are you a prospective student or alumnus of Dickinson College who can’t make one of our guided tours? No problem! You may also consider taking a free self-guided tour during farm working hours, 8am-5pm Monday-Friday. Please email farm@dickinson.edu to arrange a self-guided tour. Self-guided tour brochures are located in the kiosk by our parking lot. Self-guided tours are intended for small groups (1 – 5 people); any more than that and we would prefer that you contact the farm to arrange for a guided tour. Except for guided tours and special events, we are closed on Saturday and Sunday. How about downloading our self-guided Audio Walking Tour and Walking Tour Brochure (hard copies available in the welcome kiosk by the gravel parking area at the farm) to your smartphone or other mobile device? This tour, which was created by Dickinson student farmers and takes about one hour to complete, will guide you to key areas of the farm and provide helpful information about what you see. Guided tours are led by a farm staff member or a student farmer and include stops at our children’s garden, greenhouses, compost rows, production fields, livestock pastures, yurts and solar energy installations. Most tours take about one hour. As the Dickinson College Farm is a working vegetable operation, not all requests for guided tours can be met. Please contact farm@dickinson.edu to request a guided tour before your visit. All tours start at the kiosk by the gravel parking lot. Please avoid parking on grass or along Park Drive, which limits visibility for other folks leaving the farm! The Dickinson College Farm is a working farm. Parental supervision of children under the age of 13 is required at all times. 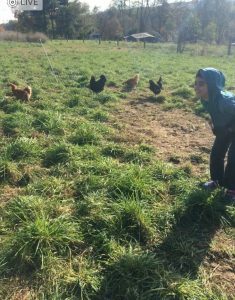 Children may not move about the farm without appropriate supervision. The Dickinson College Farm is a production farm that supports the academic and educational interests of students at Dickinson College. We are also passionate about offering food and sustainable farming educational opportunities to area youth. We have worked with area partners to create 2 formal youth education programs: Sustainable Earth Education or “SEED” (in-class lessons and on-farm field trips) and Farm, Cook, Eat after school cooking classes. We also work with area high schools to offer internships to self-motivated high school applicants who are interested in sustainable agriculture. We ask for the discretion of organizers when determining whether a group is old enough to participate in a farm tour. In general we recommend a minimum age of 3rd grade. Our limit is 25 attendees (combined students and chaperones) per tour. Depending on the availability of farm staff, it is possible to split groups into separate tours but such accommodations are not guaranteed. We are unable to offer hands-on components such as planting or harvesting. All tours are limited to 1 hour. If groups are interested in pairing a tour with an educational component, they should fill out the request form found on our SEED website. The farm tour program is donation-base. The suggested donation is $5 per guest. 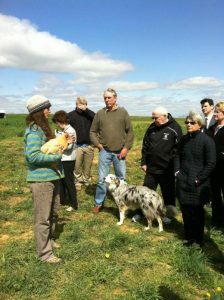 School groups may only visit the farm on days/times when we can schedule a guided tour. Self-guided tours are intended only for prospective Dickinson College students, families of Dickinson College students or Dickinson College alumni. Please email farm@dickinson.edu to inquire about a guided tour for your school or educational program. Tour requests will be accepted or declined based on farm staff and student availability. Please contact us at least 3 weeks ahead of time. Annually, the Dickinson College Farm opens its [barn] doors to the public. This page will be updated with upcoming tour dates as they are scheduled.